Definition: Gas gangrene is the death of body tissue, which is also known as clostridial myonecrosis and myonecrosis. Clostridial myonecrosis, a type of gas gangrene, is a fast-spreading and potentially life-threatening form of gangrene caused by a bacterial infection from Clostridium bacteria. The infection causes toxins to form in the tissues, cells, and blood vessels of the body. These bacteria will release toxins that cause tissue death and release a gas. Myonecrosis is a condition of necrotic damage, specific to muscle tissue. It is often seen in infections with C. perfringens or any of myriad soil-borne anaerobic bacteria. Bacteria cause myonecrosis by specific exotoxins. Gangrene commonly affects the extremities, including our toes, fingers, and limbs, but it can also occur in our muscles and internal organs. Gangrenous infection by soil-borne bacteria was common in the combat injuries of soldiers well into the 20th century, because of nonsterile field surgery and the basic nature of care for severe projectile wounds. Treatments for gangrene include surgery to remove dead tissue, antibiotics, and hyperbaric oxygen therapy. The prognosis for recovery is better if gangrene is identified early and treated quickly. 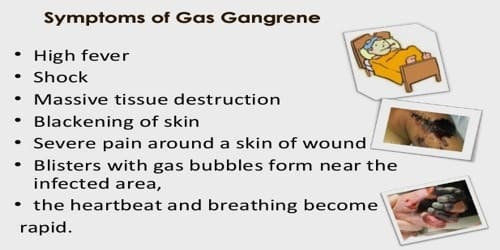 Gas gangrene is a rare condition. However, it can quickly become a life-threatening infection when it goes untreated. 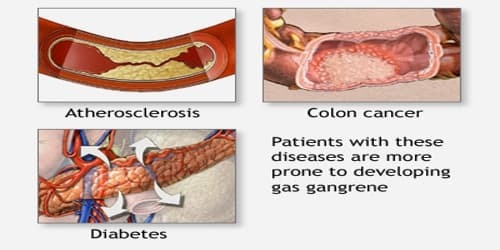 Causes, Sign, and Symptom of Gas Gangrene: Gas gangrene is most often caused by bacteria called Clostridium perfringens. It also can be caused by group A streptococcus, Staphylococcus aureus, and Vibrio vulnificus. Clostridium is found nearly everywhere. As the bacteria grow inside the body, it makes gas and harmful substances (toxins) that can damage body tissues, cells, and blood vessels. Gas gangrene can cause myonecrosis (muscle tissue death), gas production, and sepsis. Progression to toxemia and shock is often very rapid. It can easily be noticed by the large, blackened sores that form, as well as a degree of loud and distinctive crepitus caused by gas escaping the necrotic tissue. Medications or drugs that are injected. Gas gangrene develops suddenly. It usually occurs at the site of trauma or a recent surgical wound. In some cases, it occurs without an irritating event. If the condition is not treated, the person can go into shock with decreased blood pressure (hypotension), kidney failure, coma, and finally death. 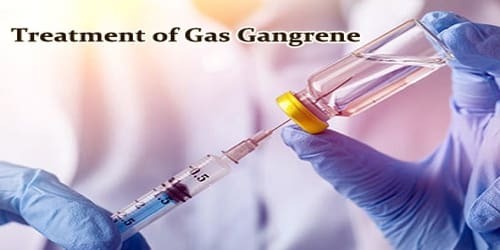 Diagnosis and Treatment of Gas Gangrene: The doctor can diagnose gas gangrene by performing a physical examination and ordering various tests. Fluid or tissue culture. A culture of the fluid from a blister on your skin may be examined for the bacterium Clostridium perfringens, a common cause of gas gangrene, or the doctor may look at a tissue sample under a microscope for signs of cell death. Treatment is usually debridement and excision, with amputation necessary in many cases. Water-soluble antibiotics (such as penicillin) alone are not effective because they do not penetrate ischaemic muscles sufficiently to be effective. Penicillin is effective against C. perfringens. The growth of C. perfringens is inhibited when the availability of oxygen is equivalent to a partial pressure of around 9–10 kPa (compare to 4–5 kPa in venous blood under normal conditions, with 11–13 kPa in arteries and 21 kPa in air at sea level), so if the treatment is started early, this condition can mostly be cured. Surgery is needed quickly to remove dead, damaged, and infected tissue. Surgical removal (amputation) of an arm or leg may be needed to control the spread of infection. Amputation sometimes must be done before all test results are available. Some doctors and hospitals use hyperbaric oxygen therapy to treat gas gangrene. This type of therapy involves breathing pure oxygen in a pressurized chamber for about 90 minutes.